I was introduced to the works of L'Engle in my 20's and that was 20 years ago. In the last 20 years I have read over thirty of her books, and few authors have had such a huge impact on my life, my faith, and ironically my returning to the Catholic church. But I read most of her books before I got into reviewing, and have yet to write a review of any of her work. And for the most part that is what this book is about, it is about the impact L'Engle has had on art and artists. Earlier this year I read Becoming Madeleine A Biography of the Author of a Wrinkle in Time written by L'Engle's granddaughters Charlotte Jones Voiklis and Léna Roy. The two books are completely different and yet both give us greater insight into L'Engle the woman, the artist, and the icon. 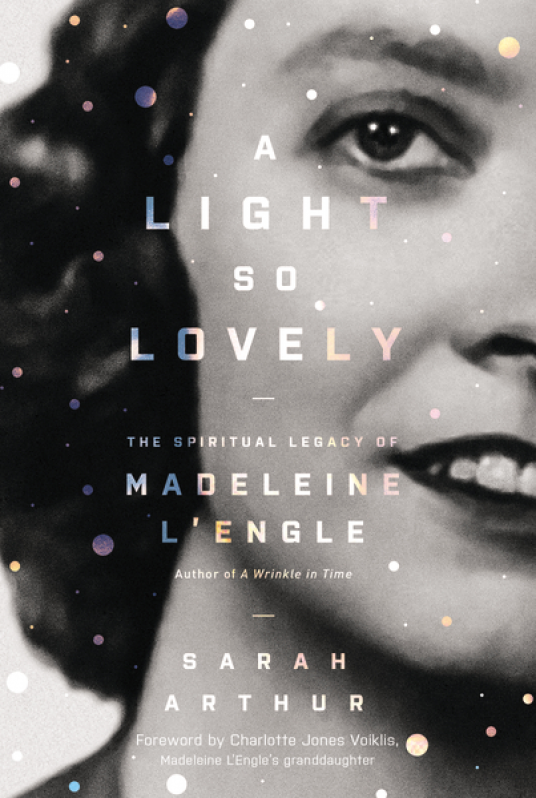 "… as Sarah asked me questions and shared her thoughts about my grandmother, I knew I'd met someone with deep compassion, curiosity, and intellect. We talked about my grandmother's life: her habits, milestones, and challenges, and what we each knew to be her impact on others. As we spoke, what moved me to tears was Sarah's willingness to look at Madeleine and accept her as a full and flawed human being; an icon and iconoclast, not an idol." "Chapter One-We'll survey her life and works as a whole, attempting to identify her spheres of influence, both as a cherished friend and mentor as well as a complex, flawed human being. Chapter Two-We'll dive into her story where many readers do, with A Wrinkle in Time-a book that, like Madeleine herself, somehow bridges the often vastly different worlds of sacred and secular in American culture. Chapter Three-We'll step back and trace her own spiritual formation as a child through the influence of great stories that gave her hints and glimpses of God's truth. impact of scientists on her conversion to Christianity when she was a youngish write-at- home mom. Chapter Five-We'll chart her profound spiritual influence on others during her prolific middle age, particularly her continued assertion that artistic practice is a religious vocation. Chapter Six-We'll make the difficult turn toward her personal challenges later in life-the loss of her son, among other things-and her troubling propensity to blur fact and fiction. Chapter Seven-Finally, we'll identify the ways that Madeleine attempted to battle the darkness, especially in her own soul, and to cling with resolute desperation to the light." As such the book is a great addition to the growing canon of work on L'Engle's life and influence. It is well written and engaging. It can easily be read by older teen fans of L'Engle's works, and those of us even older than that will appreciate it greatly. Personally, as a fan of all of her works, especially her religious works this book sheds so good light on the icon and her process. L'Engle was an enigma in her lifetime, many Christians disliked her work as not orthodox enough, and non-Christians and the intelligentsia looks at her works with suspicion because of all the religious content. This book in part looks at how she handled that, and how the artist in her continued on and continued to create. Well worth the read for any fan of her works, and looking for a glimpse of the impact she has had on authors and artists over the last 60 plus years. Note: I in part owe my own writing reviews to L'Engle, I met her at a conference in 1997, I grew up with a dual form of dyslexia and was told by a high school teacher that half of what I wrote was worth publishing, the other half for wiping his a.. L'Engle encouraged me to write, and I have published over 2000 reviews and written for 8 different publications.